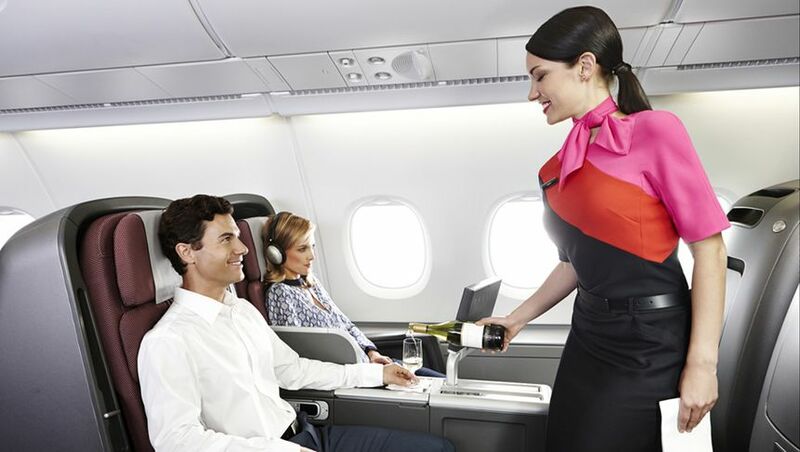 Qantas' flagship Airbus A380 flies to Singapore, London, Los Angeles, Dallas and seasonally to Hong Kong, with fully-flat beds for business class passengers along the upper deck. But not every business seat is created equal – some are better for working, others for uninterrupted sleep and also those for families travelling together. Whatever your circumstances, here's what you'll find on the Qantas superjumo and our top picks for each type of traveller. 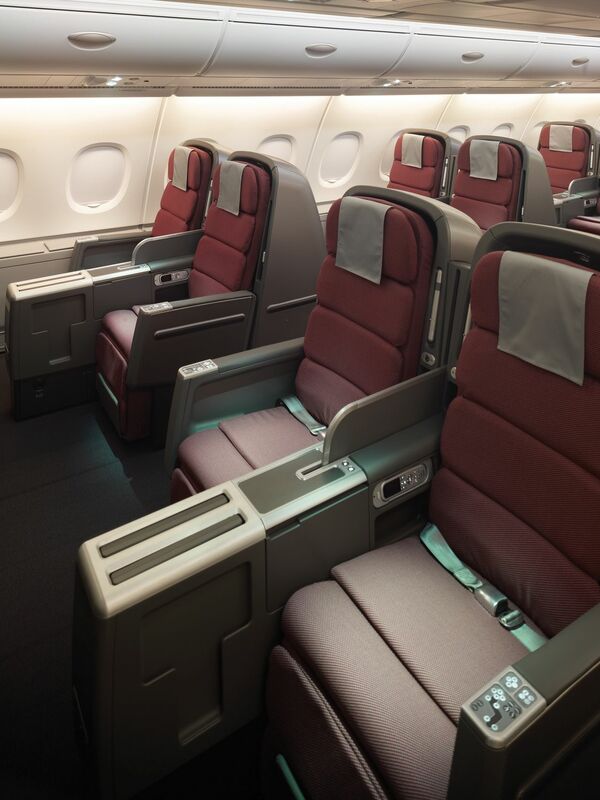 Spanning 11 rows on the superjumbo's upper deck, Qantas' business class seats are arranged in a 2-2-2 layout. The A380's business class cabin is divided into a small group of three rows of seats at the front, followed by the gallery and toilets, then eight more rows of business class. 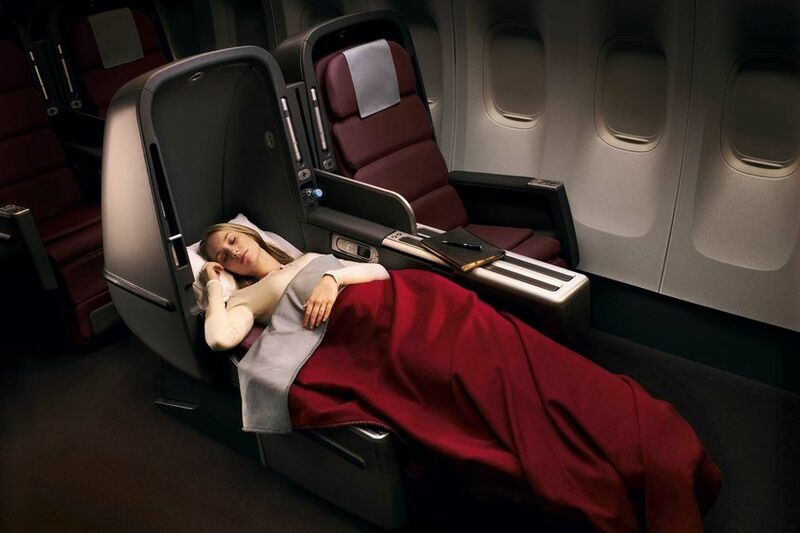 Rows 11-13: These are usually reserved for Qantas' Platinum-grade frequent flyers until close to departure, and are your best bet for privacy and a good night's sleep. Other passengers pass through the aisles here only when they need to visit the lounge at the very front, which from our experience is seldom used on overnight flights. If noise from the lounge is a concern, get a seat on the left side of these rows. You're also somewhat insulated from the bassinet seats further back thanks to galleys and restrooms in between, although lighter sleepers should opt for row 12 to avoid any noise from the restrooms behind, or any talking from the lounge in front. Row 15: Next back, check to see if seats in row 15 are free – there's no centre pair here, so these seats can feel a touch more private. But if noise from the galley or the chance of a baby nearby is a concern, keep on walking. Rows 18-19: Smack bang in the middle of the main business class cabin, these seats are as far away as you can get from the forward business lavatories, galleys and bassinets before approaching those at the rear, and being equidistant from the bathrooms means you're less likely to have people walking past your seats in the aisle. Any E or F seat: A downside of the 2-2-2 layout is that most passengers need to hop over somebody to reach the aisle or must be hopped over themselves, but the seats in the centre E & F pair don't have this problem as there's an aisle on either side. Extra storage? 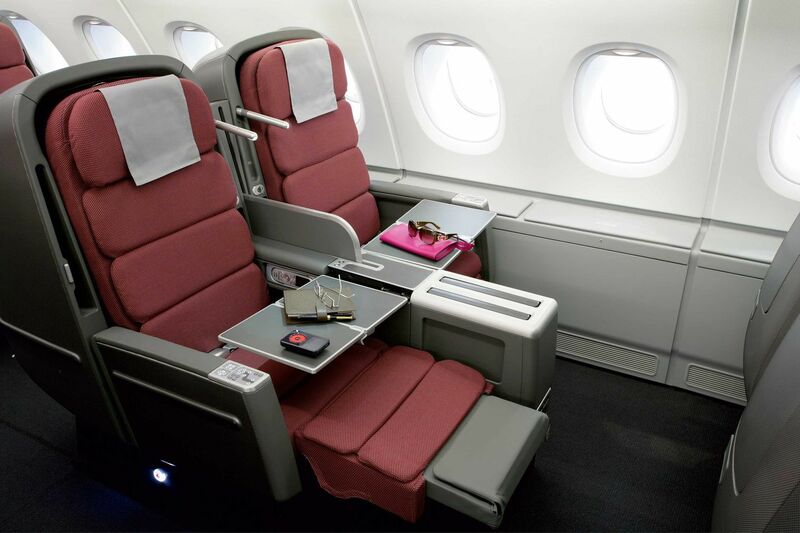 A & K seats: Qantas' second-generation Skybeds don't offer much by way of in-seat storage, so if you're armed with a laptop bag and want easy access to it throughout the flight, pick a window seat as these boast space-saving side bins that are perfect for this – except in row 20. (admittedly, I prefer Qantas' old F in the 747's! when going to the US as an 'avgeek') this tiem though from Heathrow, and getting seat 13E which was nice. I'd recommend seats 11A or 11K but not really any other seats in row 11 as when someone walks through the cabin when dark to or from the 'Qantas couch' the light shines through which is quite bright and annoying when sleeping. Row 13 had little noise as there is also a sizeable cupboard for jackets between it and the galley. Between the forward and rear cabin I would recommend the forward cabin always. As long as Qanta keep these comfortable seats and don't degenrate to the low standard of Emirates on their A 380, they have my vote. Also worth noting that the second half of the cabin has their service beggining from row 18 - so it's a good place to be seated. The best, is there one by comparison to any decent airline? Sorry QANTAS, 2x2x2 just doesn't cut it. I know its frustrating but there's no way QF won't update the A380's hard product eventually. They'll probably do it after the Dreamliners arrive and free up 747s (to use as substitutes for the A380). The simple fact is that even with QF's galley configuration, the Business Suite gives 1" longer, 1.5" wider beds and direct aisle access to all customers AND will fit at least 4 extra passengers PLUS two additional lavatories within the same area. Qantas know this. They aren't stupid enough to really believe that Skybed 2 isn't outdated. Wait until the 787-9s arrive. Then we'll see the A380s get refreshed. I'll take any of the E or F seats when travelling alone - thank you.. middle aisle, plenty of overhead stowage space - and noone crawling over you in the middle of the night. Or happily A/B or J/K when travelling with SWMBO. I avoid 11 F or J - being too close to the front seating area - as often been woken up by loudmouth folk having a few drinks together mid flight. Try to avoid 15A or 15K when travelling alone as it is awkward fumbling over B or J. The noise and lights from the galley can be annoying, especially on the o/n journey back to Oz. Grabbed 12A, 12B and 12E in both directions for an upcoming trip. Looking forward to trying "Emerald City". The seats in the first photo are looking a bit tired. As much I would love to have continued to support our national carrier but sorry Qantas but your aged J class doesn't cut it for me anymore , as an example let's compare Qantas to their partner Emirates and Qatar whose A380's offer 1-2-1 layout, modern individual suites, inflight stand-up bar (not a red park bench), Qatar offer dine on request service, electronic window shades, larger sized TV screens (which I'll add allow you to watch the inflight safety demonstration), modern fleet, chauffeur service, modern airport lounges etc. However, Qantas continue to be deluded to believe they still have an elite J product and services so they can charge the same premium amount as EK and QR... when I'm forking out approx 7K I know where I would want to spend my money. I agree that the seat is fairly dated, but, for what it's worth, Qantas does 'let' you watch the safety video on the seatback, are opening some pretty decent new lounges (new BNE lounges just opened, LHR is opening soon), plus they offer chauffeur service for their LHR flights. They only offer chauffeur because EK does. That why its not offered any more on routes like LAX or DFW. Qantas worst J class seat Perth- Singapore & return on that crop duster they use for domestic flights the 737-800 (oh with winglets makes me more comfortable already). Sat next to Kim Beazly once and he is a very tall and large man that could bearly get in his seat....poor bugger! Not when they still use the A330-200 with its 2x2x2 angled seats. The seats on the A380 are no longer flat Chris. I really wish ABT would highlight that to QF. Simply the footrests lag and have done so for some years now. A clear winner of a seat 10 years or so ago but no longer - it's not acceptable. As for the reduced toilet situation on the A380 (and now the 787) for 'Business Class' passengers don't get me started. Ask for the ice bucket. PS And the single J lav in A330's - what gives? Why do you QF always give with one hand and take with the other? Simply detest any 2-2-2 layout, zero privacy! Ditch QF for business on any Airline, usually SIA or Cathay, which ensure the 1-2-1 configuration. Intriguingly, the QF 320s from Brisbane to Singapore returnh ave the 1-2-1 configuration. Known as the Bin-Sin or Sin-Bin route, it is fun and a great way to connect if traveling further East or West. Just returned on QF8 and received 11E&F on an upgrade. Amazingly good and terrific. Virtually no traffic into front lounge; the smaller cabin - three rows - brilliant; so much leg room; too much luggage space in locker; so quiet. So handy to be able to slip into the lounge (from either seat E or F. Just terrific in all respects. Crew marvelous as usual. A truly enjoyable, comfortable and pleasant trip. Thanks Qantas. Im on QF 127 to HKG in Feb. seat 13B. Is there a first class cabin on this flight? The best business class seat is on SQ 14A streets ahead of QF in all respects. Another reminder of how rubbish QF J is! QF J on a380 is rubbish compared to the major players, particularly emirates and qatar. I flew Qatar to Europe at Christmas last year. Dine on demand, great seats which don't sag, decent wine and champagne ( better wine than QF F), great lounge and roughly half the price being asked by Qantas. The J product on their a330 is competitive but I go out of my way to avoid the a380 since I last flew it in 2012! Oban do note the QF A380 is being upgraded this year and by all accounts EK is mixed and Qatar is broke. QF is by far the most profitable of the three so they do something right. The A380 is such a quite ride that the bed is fine. I flew in from HK last night on the A380 and the seats I had would not lie flat at all. I could not be moved as flight full. New J fine this old one I personally will avoid the A380 until upgraded. Ironically in both directions they lost one of my bags. You'll have to explain the ironry there? Irony - one expects a bag to make it in this day and age. Preferred seating is 12AB/JK if flying with family or 12EF if flying alone. However as mentioned very few (if any) pax use front lounge so row 11 comes into play. However seats A and K are great with their extra storage. Have flown in 13E several times, centre forward cabin is great. Trick with the seats to get a level surface is to raise the back rest a couple of inches. Sure, it’s no longer technically lie-flat but it’s hardly noticeable. I’m going to miss the space when they do the update. Skybeds... pass the spitoon please. Comment on "The best business class seats on the Qantas Airbus A380"